Next week (April 7 to 13) is Make-a-Will Week in British Columbia. The provincial government promotes this week every year to encourage the public to write their will or bring an existing will up-to-date. Why do I need a will? Why should I make one? A will is a legal document that leaves instructions about what you want done with everything you own after your death. 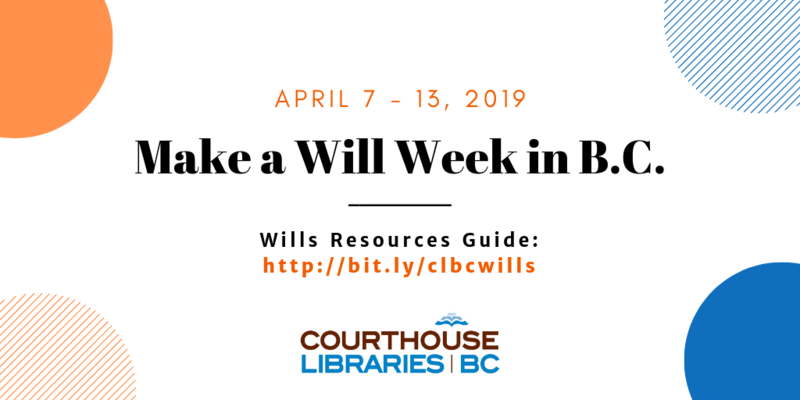 If you die without a will, your property will be divided according to the law in BC. It could make things more difficult for your loved ones. I want to make a will. What should I do? You could start with reading any of the free resources available for British Columbians. Go to the Courthouse Libraries BC website for a complete list of resources and services, prepared for various audiences: http://bit.ly/clbcwills. At the Wills & Personal Planning Resources page, you could also find information about personal planning documents, such as Representation Agreements and Enduring Power of Attorney. For a quick overview, this one-pager for everyone (PDF) comes handy. The handout is also available for public librarians & community helpers (PDF), as well as for lawyers & legal professionals (PDF). Feel free to print and distribute these handouts, but please highlight the short URL that directs back to the Wills & Personal Planning Resources page: http://bit.ly/CLBCwills. As part of BC Law Week, People’s Law School has made free public legal education classes available for you in various locations in the Lower Mainland and Vancouver Island. Many of them are about wills and personal planning. You can see the complete listings here and find one to attend. Mark your calendar for Saturday, April 13. From 10:00 am to 2:00 pm that day, you can call 604.687.3221 or 1.800.663.1919 and speak with a wills & estates lawyer for FREE for up to 15 minutes. This great service for anyone in BC is made possible by the Canadian Bar Association BC as part of their annual event Dial-A-Lawyer Day. Other areas of law available for the phone call are business, employment, family, immigration, and tort & motor vehicle.